At first glance the Samsung HMX-H200 looks like a conventional DV tape camcorder, but there's a stack of features lurking beneath the shiny black surface. The Samsung is indeed a solid state camcorder that records to an SD/SDHC card. It has no built-in memory, but other members of the range have 8GB (HMX-H203) to 32GB (HMX-H205), which can raise the price as high as £360. The HMX-H200 records video at 1080p, with options for 720p and DVD quality, but we were surprised to see the Samsung sporting a 20x optical zoom and touchscreen controls, as well as being able to take 4.7-megapixel photos. The HMX-H200 sells for £300, but we found it at Dixons for £252 and, frankly, we smelled a rat. A camcorder with that sort of specification and such a low price must be flawed. If you look hard enough you will indeed find one or two minor issues. For instance, you have to flick a switch to open the sliding lens cover. The supplied AV cable is simply enormous, and Samsung supplies a USB cable, but not a Mini HDMI cable. Video quality is good, but not great, and doesn't quite match the Canon; however, the Samsung is superbly usable and has excellent controls. Press the hardware menu button on the fold-out screen and you have icons for iScene profiles, resolution, white balance, EV (light intensity) and focus (auto, manual and touch point). Alternatively, use the software menu button and you have two vertical tabs: one for video settings and the other for system settings. Plug in a USB cable and the Intelli Studio software launches. The software checks the Samsung website for updates and installs the latest version on your laptop and then imports photos and video from the camcorder. 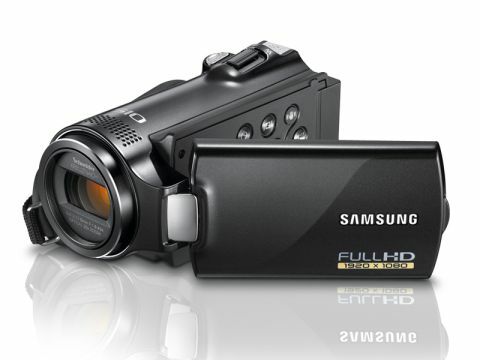 All in all the Samsung HMX-H200 is an excellent camcorder with some great features.